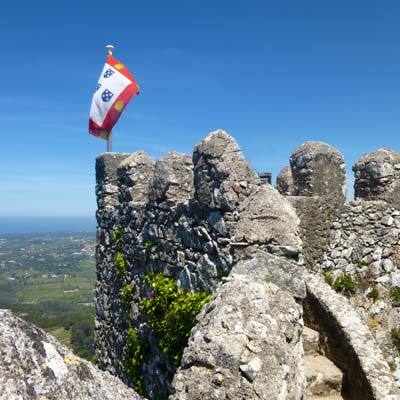 The Castelo dos Mouros (The Moors Castle) is a ruinous castle that is set amidst the lush forests of the Serra De Sintra and is a popular tourist attraction of Sintra. The Castelo dos Mouros was established during the 9th century by the North African Moors to guard the town of Sintra, but it fell into disrepair after the Christian conquest of Portugal. The castle was restored in the 19th century by King Ferdinand II, who transformed it into a romantic ruin and a major feature of the gardens of the Pena Palace. The castle retains the charm of an ancient ruin, with dense forest surrounding the crumbling battlements that offer spectacular views over the Sintra region. The Castelo dos Mouros is a highly recommended attraction in Sintra and is very different to the other palaces and stately homes of the town. The castle was originally designed as a watchtower, and it's easy to see why! 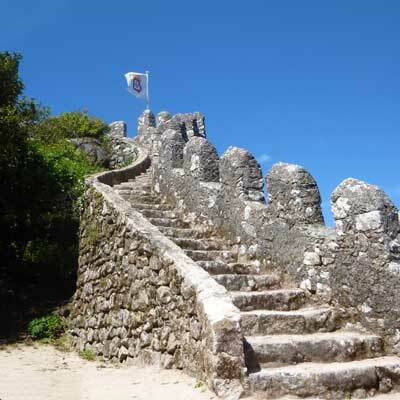 The castle lies 3.5 Km south of Sintra but the route involves a steep climb into the Serra de Sintra. The recommended means of travel to the castle is to catch the 434 Sintra tourist bus, which connects the train station, the town centre, the Moors Castle and the Pena Palace. The entrance to the Pena Palace is less than 200m from the entrance to the Moors Castle and can be easily walked. 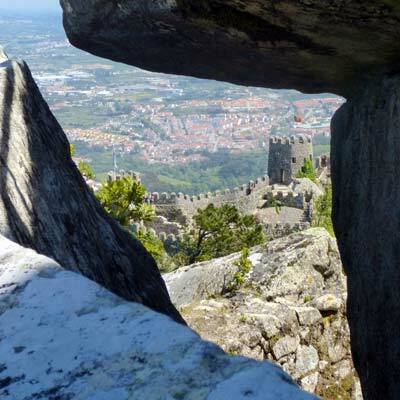 Why Visit the Castelo dos Mouros? The Moors castle is a classic ruined castle with high fortified stone walls, treacherous ramparts and massive battlements all of which can be fully explored. 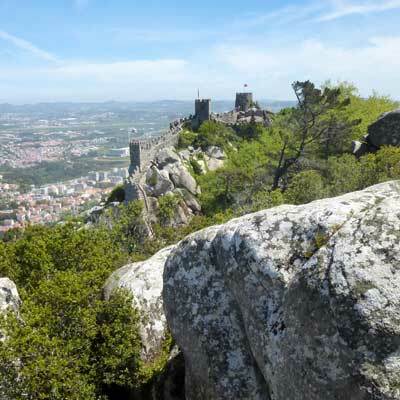 From the high vantage points there are wonderful panoramic views over the hills of the Serra De Sintra and the plains stretching west to the Atlantic Ocean. 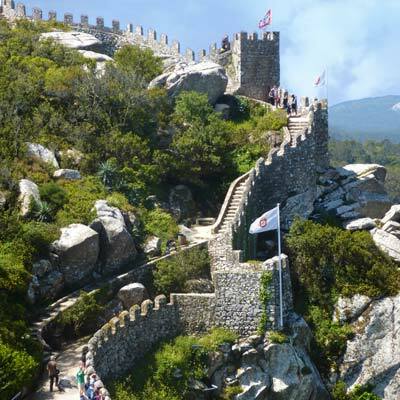 The Moors castle does not have the history of National Palace or the extravagance of the Pena Palace but it is still highly recommended and an enjoyable attraction of Sintra. The origins of the castle date back to the 8th century and invasion of the Muslim Moors from North Africa. 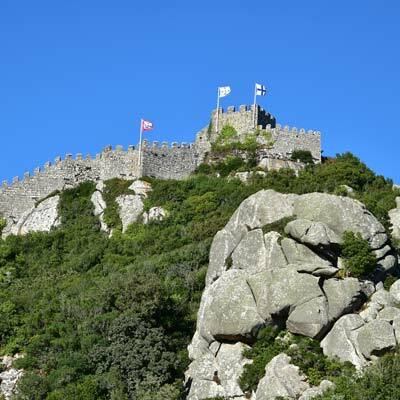 The position of the Castelo dos Mouros was selected as it provided a suitable vantage point over the River Tagus and offered protection to the town of Sintra. Arab chronicles detailed that the Sintra region was very rich in cultivated fields and the Castelo dos Mouros was one of the most important castles in the region, even more important than the castle of Lisbon. An initial Christian crusade, led by King Alfonso VI of Castile, managed to capture the castle in 1093 but the limited forces were driven out the following year. The castle flourished between the first and second Christian crusade and this was regarded as the high point of the castle's history. The fortifications of the Castelo dos Mouros were greatly enhanced but were not enough to repel the second much larger Christian crusade in 1147. This crusader army was comprised of drunks and thieves, who upon liberating Lisbon promptly sacked the capital. Early Portuguese kings strengthened the Moors castles defences but the royal court favored Lisbon. The significance and importance of the Sintra castle reduced over the centuries and by the 15th Century the Jewish settlers were the only inhabitants. When the Jews were expelled from Portugal the castle was completely abandoned. In 1636 a lightning bolt caused a massive fire that wrecked the central keep while in 1755 the devastating earthquake leveled much of the walls and battlements. The Moors castle in this era was so insignificant that it was not even considered in the plans to rebuild after the earthquake. The Castelo dos Mouros was destined to be forgotten and permanently ruined. That was until King Ferdinand II transformed the entire Sintra region. Ferdinand II was a king obsessed by art, drama and the good life - he romanticised the middle ages and ordered the reconstruction of the castle. The castle was reconstructed so as to be viewed from his beloved Pena Palace, while the grounds were designed for areas for contemplation and relaxation. His vision is what tourists are able to explore during their visit.